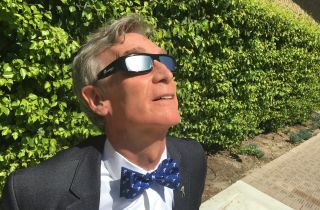 Bill Nye looking up at the sky wearing special solar eclipse viewing glasses. Bill Nye the Science Guy will join skywatchers in Nebraska for a center-stage view of the 2017 total solar eclipse on Aug. 21. Homestead National Monument of America, in Gage County, Nebraska, has planned a three-day solar eclipse festival from Aug. 19 through Aug. 21 — and Nye, who is also CEO of The Planetary Society, will be there on the day of the total solar eclipse to welcome skywatchers and introduce an educational eclipse booklet for kids. The national park is located near the centerline of the path of totality and will experience 2 minutes and 34 seconds of darkness as the moon passes directly in front of the sun. The Junior Ranger Eclipse Explorer booklet is a collaboration between the National Park Service (NPS) and The Planetary Society. Approximately 50,000 booklets will be printed and distributed to visitors at national parks across the country, and they include activities and a set of eclipse glasses. The booklets will also be available to download from the NPS website later this summer. "The Planetary Society is over the moon to partner with the National Park Service for this great North American eclipse. Through a remarkable cosmic coincidence, our moon is of just the right size and at just the right orbital distance from us to completely block out the sun every couple years — a total solar eclipse," Nye said in the statement. "This year, this phenomenon will sweep right across the world's third-most-populous country. It will be spectacular. We encourage everyone to experience this rare, extraordinary event. It's going to be cool — I've been looking forward to it for years. Experiencing an eclipse changes the way you feel about the cosmos and our place in space." To celebrate the spectacular celestial event, Homestead has planned three days' worth of festivities (Aug. 19 through Aug. 21). The solar eclipse will reach totality at that location at 1:02 p.m. CDT on Monday, Aug. 21. The events include scientific presentations from NASA officials, science and astronomy programs led by PBS Kids' 'Ready Jet Go!' and stargazing events at night. Park visitors will also have the opportunity to see performances from the Many Moccasins Native American Dance Troupe and local musicians. You can find a full schedule of events here; the park recommends visitors check back regularly for schedule updates or changes. The Planetary Society and the NPS "share a mission to deliver enjoyment, education and inspiration to people of all backgrounds, with a goal to provide an array of eclipse experiences designed to empower and delight visitors and other eclipse viewers across the country," Engler said in the statement. Entrance to the Homestead National Monument and all eclipse events are free to the public. The total solar eclipse is expected to draw large crowds to the park. Visitors should be prepared for possible traffic delays and congested parking lots, and should bring plenty of water, food and other necessary supplies. Special glasses are also required in order to safely view the solar eclipse until the sun is completely covered by the moon. "The National Park Service is a wonderful source for science learning, because kids get outside and do some real field work," Nye said in the statement. "At parks and monuments, you can learn some geology, anthropology and astronomy, and gaze at the night sky. The Junior Ranger program offers great resources for the eclipse. We hope millions of kids and families get out to enjoy the experience. Don't forget your viewing glasses; they let you look safely right at the sun."